Illinois’ new governor, J.B. Prtizker, took the oath of office Monday with a collective call for elected officials to end their abdication of responsibility, and with a promise for what’s become a rarity: a balanced budget. That responsibility will fall squarely on Pritkzer’s party. With the transfer of power from Republican Gov. Bruce Rauner, Democrats are now in complete control of Illinois government, holding a majority on the Illinois Supreme Court, every constitutional office and supermajorities in both legislative chambers. It was one of several direct swipes he took at Rauner, who was watching from his front row-seat, and who four years ago outlined his vision for the state while also bemoaning its history of “busted budgets and broken government.” Rauner’s insistence on passing union-curbing reforms, and Democrats’ refusal to approve them, set off a partisan stalemate that kept Illinois without a budget for a historic 793 days. Many Republicans said they’re ready and willing to cooperate with Pritzker, too. Illinois Republican Party chairman Tim Schneider, meanwhile, took a difference stance. “It’s clear that Governor Pritzker’s agenda will be the same agenda that has dragged our state down for decades – borrow, tax, spend, repeat,” Schneider said in a statement. “Over the course of the election and again today, Pritzker promised billions of dollars in new spending, programs, and regulations, all of which our state cannot afford. In the transition from the Rauner to the Pritzker administrations, Illinois is trading one wealthy businessman for another (though Pritzker takes the mantle; upon his noon swearing-in as Illinois’ 43rd governor, Pritzker became the wealthiest elected official in the nation. Forbes estimates his personal wealth at $3.2 billion). Neither held elected office prior to winning the top role in state government. But their visions for economic growth are far apart. Rauner stood in the way of efforts to raise the minimum wage beyond its current $8.25. Pritzker plans to raise the minimum wage to $15: “Working men and women … deserve a $15 minimum wage. It’s good for the working families of Illinois and good for our economy,” he said. Doing so will require amending the state constitution. Despite consistent questions throughout his gubernatorial campaign and since, Pritkzer has avoided getting into any specifics about what a graduated tax framework might look like, and when he’ll make such a plan public. 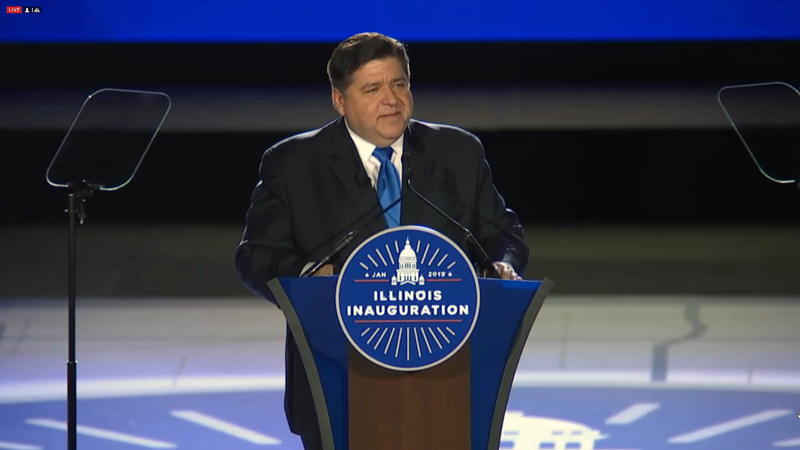 Pritzker also used his inauguration-day address to highlight his plans to make Illinois a part of the U.S. Climate Accord, to pass a statewide infrastructure program and to emphasize diversity, something he’s already begun to do with his cabinet appointees. Illinois’ other constitutional officers were also sworn in Monday. Pritzker’s running mate, Juliana Stratton, is the state’s first African-American lieutenant governor. Another Chicago Democratic former legislator, Kwame Raoul, will replace Lisa Madigan as attorney general. There’s no transition of power for the remaining slate of constitutional officers: Secretary of State Jesse White begins his record sixth term. Treasurer Mike Frerichs begins his second four years. Comptroller Susana Mendoza also begins a new term. She got personal in her speech – sharing that her son David just lost a tooth, and that he’s recovering from a fever – but she made no mention that she may well be leaving Springfield should she succeed in her current bid for mayor of Chicago.